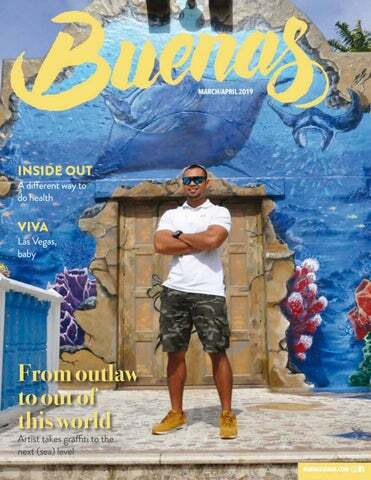 About the cover: Lee San Nicolas stands in front of one of his most recent pieces at the Onward Beach Resort. 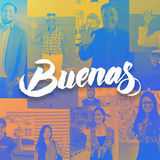 Glimpses of Guam Inc. Mission Statement: To connect people with information. Buenas March/April 2019 • Entire contents copyrighted 2019 by Glimpses of Guam, Inc.
Scientific name: Todiramphus cinnamominus CHamoru name: Sihek Estimated population: ~140 Size: Approximately 9 inches (23 centimeters) Lifespan: 3 to 5 years in the wild, up to 15 years in captivity Status: Extinct in the wild Origin: Endemic to Guam Programs and Projects: Guam Micronesian Kingfisher Recovery Program The Guam kingfisher does not fish, despite its name. Its diet consists of geckos, mice, meal worms and crickets. Male and female Guam kingfishers have different appearances. Both have cerulean wings, but males have cinnamon color all around while females have a white breast. Scientific name: Gallirallus owsotni CHamoru name: Ko’ko’ Estimated population: ~ 350 Size: Approximately 11 inches (28 centimeters) Lifespan: 3 to 5 years in the wild, up to 15 years in captivity Status: Extinct in the wild, with established populations on Rota and Cocos Island Origin: Endemic to Guam Programs and Projects: The Rail Recovery Project, Go Native! Prutehi i Islan Guåhan The Guam rail is a flightless bird native only to Guam, though there are controlled populations in Rota and Cocos Island. The invasive brown tree snake devastated the bird population. Scientific name: Bubalus bubalis CHamoru name: Karabao Estimated population: Unknown Size: Up to 6 feet in height (1.5 to 1.9 meters) Lifespan: Up to 25 years Status: Invasive (when feral) Origin: Southeast Asia, historic introduction to Guam Programs and Projects: None The local population of Guam, native or non-native, commonly refer to the water buffalo as a karabao. The karabao was introduced to the Mariana Islands from the Philippines in the 1600s by Jesuit priests for farming purposes. Feral karabao on public lands are a rare sight, but there is a population of karabao within Naval Base Guam. Scientific name: Birgus latro CHamoru name: Ayuyu Estimated population: Unknown Size: Up to 3 feet (90 centimeters) Lifespan: Up to 50 years Status: Least concern Origin: Indigenous Programs and Projects: None The coconut crab, also known as the robber crab, is the largest terrestrial invertebrate in the world. It can appear quite monstrous, but local residents see it as a source of food. The crab is known to “steal” shiny objects and bring them back to its burrow, and is very strong. Scientific name: Corvus kubaryi CHamoru name: Åga Estimated population: Less than 200 Size: Approximately 15 inches (38 centimeters) Lifespan: Up to 15 years in captivity and the wild Status: Critically endangered Origin: Endemic to Guam and Rota Programs and projects: Mariana Crow Recovery Project This is the only species of crow found in Micronesia. Once common in Guam and Rota, the crow population drastically declined with the introduction of the invasive brown tree snake. The 1st Annual MBJ Life Charity Golf Tournament was held on Dec. 2 at the Starts Guam Golf Resort in Dededo. SEND US YOUR PHOTOS! To submit your photos for Out & About, email high-resolution photos to lifestyleeditor@glimpsesofguam.com with “Out & About” in your subject line. Please include the description, date and location of your event photo(s). The Guam Association of Realtors dressed up for the associationâ&#x20AC;&#x2122;s annual Installation Dinner on Feb. 1 at the Hyatt Regency Guam. any residents head to Las Vegas for the attractions the desert city offers — the chance to play the gaming tables, take in a couple of shows and laze in a hotel that offers the buffets that Guam residents love to graze. But Nevada and other nearby states have a lot to offer. Alternatively, if Las Vegas is not your first pit stop on the mainland, it makes an attractive side trip for those looking for some table action and nightlife. The famous four-mile strip offers a chance to either stay at a luxury hotel or sightsee if your budget has you choosing a more economic chain than the famous Egyptian-themed Luxor Hotel & Casino or the Venetian-themed Bellagio Hotel and Casino. And don’t forget the famous MGM, among the first in Las Vegas. A little preparation is essential. Grab a map if you’re staying in a mid-range hotel, and prepare for some group shots or selfies against the larger-than-life Egyptian pyramid, Venice’s Grand Canal, or simply the bright lights as part of an evening walk. You can even take a Venetian gondola ride for an Italian experience outside of Italy. If playing the tables is part of the attraction — do some research on the casinos. Various hotels are known for either the variety of games they offer, the best location for the non-player in your group, or the food. The time-honored advice for those new to the tables is to study the rules and keep your bets low to begin with. Plan a budget for that activity so that your funds can stretch to all you have planned, but who knows — you might be the winner of the day. If you’re looking for the user-friendly slot machines — don’t worry, they are everywhere including the stores and gas stations, but not in the lobbies of the top hotels. There is an etiquette to playing at the tables — read up on that too, and look for the casino’s point system. If you don’t want to look like a rookie at the tables, plan to take some lessons in games that are relatively easy to master, like Black Jack. Las Vegas has food options from an early breakfast through to a late dinner and you can find a variety of discounts. Choose between the comfort of great steakhouses, celebrity chef venues or a name brand chain we don’t have on-island (yet). Expect crowds, because Las Vegas attracts more than 40 million tourists a year and greater Las Vegas also has more than two million residents, so you might choose to make a reservation for fine dining, if that’s part of your Vegas bucket list for one of the evenings. GETTING THERE How to get there: Fly to the U.S. mainland via Hawaii or Japan. Best time to go: From March to May or from September to November, so think spring break or a fall getaway. Hotel prices tend to be higher around the weekend, and watch out for major convention times when hotels get full. Must see: Famous casino hotels, the Strip, a Las Vegas show Stay: In a hotel to suit your budget. Self-catering options are available. What to take: Vegas can get hot and sunny, so plan to take sunscreen. Alternatively, the nights can be cool in the desert climate, so pack a light jacket or sweater, or prepare to buy a glitzy jacket as a souvenir. Las Vegas buffets are an attraction all of their own, and include kid-friendly options. If you’re beginning to pine for the great outdoors after a couple of days — Las Vegas offers patio and garden dining options and the chance to enjoy a mild and dry climate. The city offers vegetarian and gluten-free options also, if that’s what you’re looking for. Hawaiian food, Mexican food, Korean food and Kobe beef — there’s no end to the options for cuisines either. This may be the trip to step outside your comfort zone and try a Brazilian restaurant — also famous for great meat — or another international cuisine you’re not familiar with. Going to Vegas with that special someone? You might give in to the temptation of a Vegas wedding and some stories and photos to wow your future generations. You’ll need a license (valid for one year if you initially get cold feet) and the knowledge that weddings are legally binding. Your hotel might be able to help with planning and lay out some options for your special ceremony. Vegas can make a really great wedding venue if you have stateside relatives who’d appreciate the destination and not having to fly to Guam, and the city offers everything you need to plan a wedding, including the planner, appropriate clothes if you want to dress up, and all the accessories. Away from the tables there’s a variety of side trips available. You can also book a number of attractions and get some discounts that way — spreading the trips over a few days. Options include meals in the price of the outing. Short trips include downtown walking tours for a little exercise and the option to decide to add a “we’ll see” element to eating and shopping, a chance to see some Titanic artifacts and scenic view options that include the Eiffel Tower look-alike or a big wheel for an experience in itself. Ride the Vegas monorail to get to your destination, or the open-air bus for some sightseeing without the stress and great photo ops. Nearby trips include the Hoover Dam — with a half day option — the Grand Canyon, and theme parks or you might splurge and see Vegas by helicopter. If you’re hankering to explore another side of your personality away from Guam, consider learning to pole dance and have the tee shirt to prove it, or try one of the activities such as the mini Grand Prix or the Sky Jump — a controlled free fall from the equivalent of 108 stories. If that’s not exciting enough, think about swimming with sharks at the Shark Reef Aquarium. Activities for children include a pet theater and roller coaster rides. The famous shows with famous names typically include an option to book before you go to avoid missing out on the event, or get tickets within your price range and preference. But Vegas also offers shows that feature a hypnotist, comedians or a themed evening if you’re up for some nostalgia and a sing-along with Beatles well-known tunes. Most hotels have pools for some swimming or relaxation, and gyms are an option too. Want to get a little late night exercise to burn off the buffet? Las Vegas offers clubs perfect for dancing at the end of the evening. For a lazy evening with a little less planning, the Freemont East district has plenty of options for bar hopping.